Seems honeymoon period with Gold is nearly over. Investor will surely remember 2013 as a miserable one for gold. Yellow metal suffered with biggest annual loss since 1981. This sudden drop in gold price was surprise for many investors. Many strategists are now saying forget gold and buy stocks in 2014. Investors are now wondering how the gold price will develop in the coming years. We try to provide an orientation. How gold price develop in Future? We take a look at the individual supply and demand factors that affect the price of gold, but also take into account broader, macro-economic scenarios, the occurrence of which could have fundamental implications for the gold price. In the third quarter of 2013, the demand for gold has fallen by more than 20 % compared to the same quarter last year. According to the World Gold Council, this decline was mainly due to outflows from gold funds. While in the 3rd Quarter of 2012 there were still significant inflows of more than 130 tons in gold funds, the outflows in the third Quarter of 2013 were with almost 120 tonnes almost equal. Demand for gold bars and coins had been significantly higher with plus 300 tons, but even though this meant an increase of about 6% over the previous year, this could not even nearly compensate for the outflow of gold from the gold funds. The result was that the total investment demand decreased by about 50%. However, the demand for gold for jewelry production increased slightly by approximately 1%, as well as the demand for gold in the technology sector (electronics, medicine , etc.). The demand for gold from central banks declined slightly, but was with net over 90 tons still very high. The purchase of gold by the central banks which continued for almost three years has not come to an end. 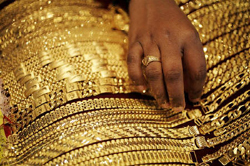 The supply of gold has decline in the third Quarter of 2013 as the total demand has, too. While mine production increased slightly, the supply of recycled gold went back – certainly caused by falling prices and extraordinarily strong sales of scrap gold over the last few years in the wake of higher gold prices. The figures shown for gold demand and the supply of gold make it clear that the decline in investment demand and specifically the outflow of gold funds was the cause of the price decline in gold in 2013. In recent years, the investment demand for gold was driven by concerns about the financial crisis and fear of loss of assets. Additionally, surely also the long-lasting positive price development was a reason that more and more investors – including large funds and hedge funds – have entered the market and driven up prices. The development was also encouraged by the spread of innovative forms of investing in gold: This is less due to physical investment products such as savings plans or vaulted gold that have been experiencing growth, but overall still account for a reasonable share of the gold market, but it is in particular due to financial products on gold. Such financial products are, especially in countries like the U.S. and UK, exchange-traded gold funds (gold ETFs) but also so-called Exchange Traded Commodities (ETC) as Xetra Gold by Deutsche Börse. At peak times, approximately well over 100 billion dollars were invested in such financial products. Unlike the classical physical gold investment products such as gold bars and coins or even new products such as vaulted gold, many investors who purchase financial products on gold often have only a short-term and opportunistic investment horizon: Thus, as the price began to turn, soon many of these investors begun to reduce their stocks, which has increased the price movement downwards. While the new instruments of gold investment have thus favored and accelerated further price increases during the boom phase, this development turned around after the – at least temporary – end of the trend and increased the drop of the price. Thus, the gold price may have become more volatile and prone to short-term trends in recent years. But many of the private investor still see gold as a means of long-term diversification of risks and a means to hedge against extreme events and losses. Apart from shorter-term developments – how could the price of gold develop in the coming years? A theme in 2013 was certainly the further recovery of the global economy and the stock markets. It is tempting to see a connection between this recovery and the decline in gold prices. In particular, investors in Western countries often buy gold as a hedge against (economic ) crises . An end of the crisis which began 2008 would push this argument in the background. In case there is a further economic recovery, the gold price could continue to decline in 2014 and 2015. In the light of continued high or even rising levels of public debt, a further deleveraging associated with only a slight economic growth in the coming years is conceivable. Despite many contrary predictions, inflation and interest rates are in many regions still at record lows. In recent years, this was – surprisingly for many – a good environment for a positive development of the gold price. One reason is that in case of low interest rates, the opportunity cost (i.e., lack of interest income) of gold investments is low. In addition, prices for stocks, real estate and other tangible assets tend to develop in a deflationary environment often below average. Therefore investors flee increasingly in gold. In developing countries such as China and India on the other hand almost an opposite logic applies: High inflation – usually as a result of high growth rates – make investments in gold attractive because of their relative value preservation. Moreover, in these countries, gold jewelry has often a much greater importance than in developed countries. A good economic performance thus leads regularly to a growing demand from these countries. Should the inflation rise one day significantly also in developed countries, an increased demand for gold as an inflation hedge would also be conceivable there always depending on the respective (real) interest rate on alternative investments. The investment firm Lupus Alpha considers a further decline in the gold price due to the low investment demand as likely and argues on the basis of technical chart considerations that the price could fall below 1,250 U.S. dollars and that even a gold price of only 1.100,- U.S. dollars per ounce is possible. The rating agency Fitch expects low gold prices over the coming years. According to their estimate of the price of gold in 2014 and 2015, the price should probably be less than 1,200 U.S. dollars. The research department of the global banking group HSBC expects for 2014 a gold price of 1,435 U.S. dollars per troy ounce and cites as reasons a strong demand for physical gold for jewelry and also bars and coins particularly from China. The Bank of America expects an at least slightly increasing gold price of 1,356 U.S. dollars in 2015. This price would represent an increase of approximately 100 U.S. dollars compared to the price of gold at the end of November 2013. Tom Fitzpatrick of the U.S. bank Citigroup even expects a gold price of 3,500 U.S. dollars in the coming years. He argues that gold would be back on the road to become the hard currency of choice, and that this trend would accelerate. The possible scenarios listed above show a variety of effects that could influence the gold price. Similar to the forecast of economic growth over the coming years, it is also not possible to reliably forecast the gold price for 2015 and beyond. Many wealthy investors who have the opportunity to diversify their investments, will therefore consider to add gold to their portfolios in the coming years. For such investors, the main goal will often not be a possible large increase in value but the protection of assets under a variety of scenarios. In the light of the investors’ goal to protect assets, safety and costs will be core aspects for the selection of suitable gold investments. Physical investment gold, for example in the form of safely paper gold / vaulted gold, will play an important role in the coming years. Note: – This article is taken from Trustable Gold. It is used as reference to enhance knowledge of readers. We have not changed content of this article. Views mention in article is of Trustable Gold.